What’s that? Rooms? Many Rooms? No, I have no idea what you’re talking about. We’ve always, always been the House of Many Doors here. Don’t touch that. Don’t peel off the fresh paint, don’t lift that tarpaulin – dammit. Okay, you caught me. I’m trying to change the game’s name. Guilty as charged. But first, let me distract you with an image of two kinetopedes trampling mushrooms. Rooms, doors, what’s the difference? This is not a decision I made lightly, and there are a couple of answers to that question. “A House of Many Rooms” had bad SEO. Really bad. Just try it – search for yourself. You get pages and pages of nothing but a Mike & the Mechanics song. I’ve spent too long now trying to convince myself that this isn’t a huge problem. I want to always, always make sure that marketing concerns do not impact the quality of my game. While I know that marketing is crucial to any kind of eventual success, and I’m trying to shout about the game as loudly and as often as I can, I don’t want that to bleed into the game experience itself. I don’t want to make creative decisions based on what I think will go viral – I know that there’s an audience for my game, and marketing should be about finding and reaching that audience, not adapting my work to appeal to a different one. But what’s a title? A title isn’t part of the game. Although it’s inextricably tied to how people will talk about the game, it’s entirely separate to the experience of playing it. Arguably, that means it’s a marketing thing, more than a game thing. Still, I didn’t want to change the title just for SEO purposes. I resolved to only change the title if I thought of something better. And I thought of something better. “A House of Many Doors” is better because doors are more interesting than rooms. Doors are mystery and potential. You know what’s in a room, but you *want* to know what’s behind a door. 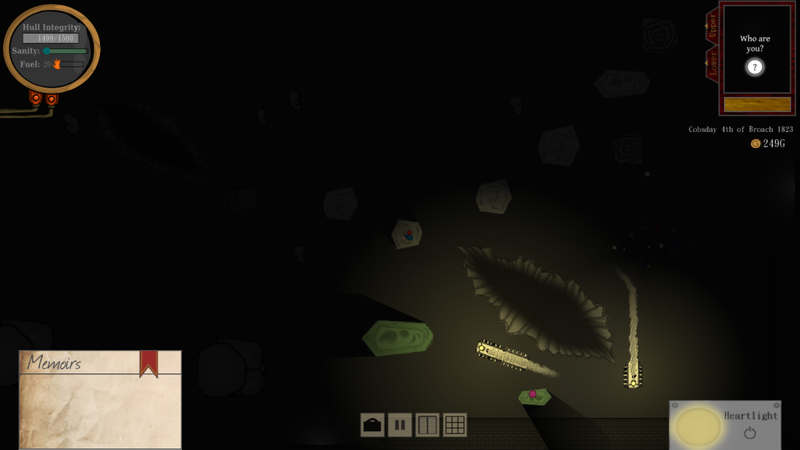 It ties excellently with my game’s themes of mystery, secrecy and curiosity. “A House of Many Doors” is also better because it’s a fairly obscure, fairly archaic slang term for both a prison and an asylum. The House is both of these things – one of the central plot points is that neither you nor anyone else can escape the House once they’ve entered, and maintaining your Sanity in the face of the House’s assorted oddities is a core mechanic. This double meaning is so perfectly apropos without being obnoxious or obvious. But I loved the new name as soon as I thought of it, and before I even discovered this double-meaning – I would have used it anyway, which I think is important. A clever bit of subtext which most people (including myself!) won’t get shouldn’t be what draws you to a title. This title just works on its own level already, and the double-meaning is a cheeky bonus. “A House of Many Doors” is better because as soon as I thought of it, it felt right. That was a lot of text. Here’s another picture. So. Name change. That’s a big thing, but I’m glad I chose to do it relatively early in the project. Let’s never speak of that again. I’ve finished the core work on combat. I still have a bunch of systems that I want to integrate – melee combat, boarding, proper consequences for loss of Sanity, equipment damage – but right now combat is playable. And even at this early stage, it’s fun. Brutal, though. Every fight is over very quickly, and while victory is achievable, each time it feels like you’re clawing it from the jaws of death. This is a feeling that I might want to keep, at least in the early game when the player is less powerful, but I’d like combat to last longer than a couple of exchanges of fire. There’s a lot of rebalancing I need to do – I think I’m going to need to get some spreadsheets out and start looking at averages. What work have I actually done on combat since last week, though, to make such a big difference? For both enemies and the player, it’s necessary to have crew in the vehicle’s weapon bay if they want their weapons to charge up. This isn’t FTL – there are no automatic targeting systems here, just burly men and women shoving huge shells into place and then covering their ears. This means that a very viable tactic is to target your enemy’s weapon bays, not to damage the equipment, but to kill the crew who are operating each weapon. Grim! 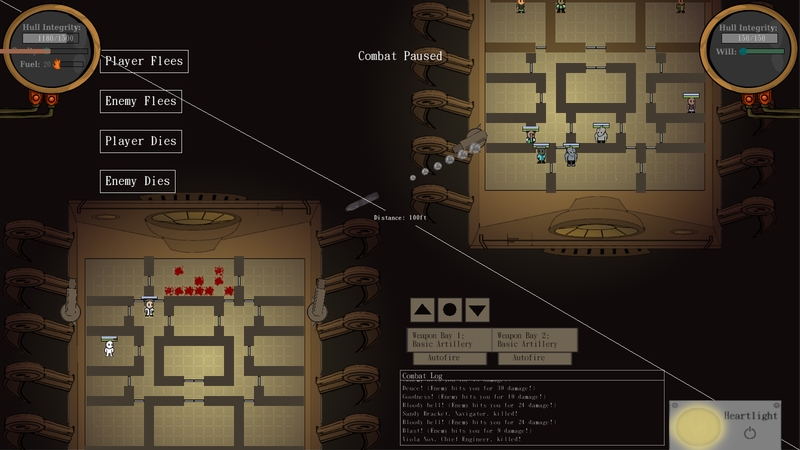 Enemy AI is now in – the enemy used to fire at you randomly, but now they target intelligently based on where your crew are standing, how much HP they have, and whether you have someone in one of the weapon bays. I actually had to dumb the AI down slightly after my first attempt – it would result in very short battles that were incredibly difficult to win. So I made the AI aim randomly once in every three times – this was necessary in order to give the player a bit of a head start, really, though for tough ‘end game’ vehicles this might not be the case. The people in the leftmost room, with the little green plus signs over their head, are being healed by the Surgeon. The Surgeon cannot heal themselves, though, so keep them alive if you can! Surgeons now increase the HP of wounded crew who are in the same room as them! And Captains and Lightbearers now increase the Sanity of traumatized crew who are in the same room as them! This means the player has a lot of tactical options available to them – they need to juggle these benefits with the fact that clustering their crew together in one room is a Bad Idea, because the enemy loves to target large groups of your crew. And finally, a Combat Log! This records player crew deaths, enemy crew deaths, successful hits on the enemy and the hull damage caused, and how much hull damage the enemy does to the player. Although it’s just text, it makes combat a lot more exciting – things happen very quickly, and pausing to read the Log provides much-needed clarity after a calamitous event. This provides immediate understanding of cause-and-effect, which makes the language of combat suddenly very clear and comprehensible. Anyway, that’s everything for now, explorers. Remember, it’s now A House of Many Doors, not A House of Many Rooms. The Rooms are merely implied by the Doors. What am I doing over the next week? 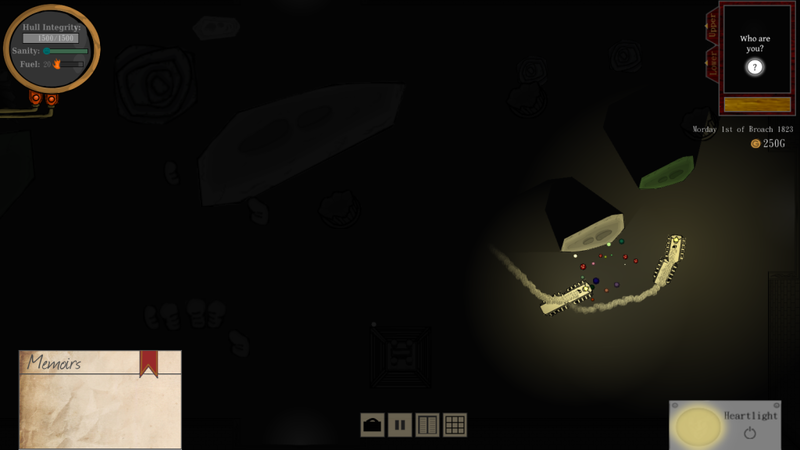 Probably a little more combat tinkering, but also a lot of work on writing and adding various events. And other exciting things.